Single-handedly trying to bring back gritty and gripping hard rock to Dayton Ohio, and all parts worldwide, is Red Hot Rebellion. Self-releasing their debut, this power trio blends classic hard rock with garage and punk rock, and maybe a touch of blues. The sound is stripped down and raw. It bristles with energy and bravado, without comprising sound melody, clever hooks, and edgy fret work. Essentially, this is bar room 'rawk,' largely developed from the waist down, and neatly packaged in CD, red or clear vinyl, or digital form (and you get a comic book with the first two). Strongest tracks include Wait and See (disgruntled workers unite), Built to Rock (it's not about the band), Devil's Rope (quite catchy, but possibly a tad repetitious), and Cooking With Gas (note the harmonica at the start). Red Hot's debut is solid stuff, good fundamental American hard rock, good for tapping a keg or starting a fight. Recommended. 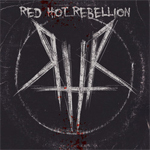 Red Hot Rebellion's debut is solid stuff, fundamental American hard rock, good for tapping a keg or starting a fight.